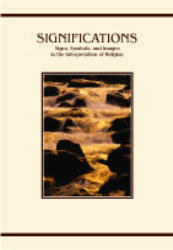 Title: Significations: Signs, Symbols, and Images in the Interpretation of Religion Author: Charles H. Long Philosophical and Cultural Studies in Religion Imprint: The Davies Group, Publishers soft cover 246 pp. $24.00 US ISBN 978-1-888570-51-9 September, 1999 Significations is a sustained criticism of several major approaches (phenomenological, historical, theological) and pre-suppositions (“shadows of the discipline”) that make up some of the work of religious studies in the United States. Within this critical spirit, Long attempts (1) a reevaluation of some of the basic issues forming the study of religion in America, (2) an outline of a hermeneutics of conquest and colonialism generated during the formation of the social and symbolic order called the “New World,” and (3) a critique of the categories of civil religion, innocence, and theology from the perspective of the black experience and the experience of colonized peoples. Contents Foreword Proem Acknowledgments Introduction Part I: Religion and the Study of Religion Chapter 1 The Study of Religion: Its Nature and Its Discourse Chapter 2 Prolegomenon to a Religious Hermeneutic Chapter 3 Archaism and Hermeneutics Chapter 4 Silence and Signification Part II: Religion and Cultural Contact Chapter 5 Human Centers: An Essay on Method in the History of Religions Chapter 6 Primitive/Civilized: The Locus of a Problem Chapter 7 Conquest and Cultural Contact in the New World Chapter 8 Cargo Cults as Cultural Historical Phenomena Part III: Shadow and Symbols of American Religion Chapter 9 Interpretations of Black Religion in America A: The Black Reality: Toward a Theology of Freedom B: The Ambiguities of Innocence C: Civil Rights — Civil Religion: Visible People and Invisible Religion Chapter 10 The Oppressive Elements in Religion and the Religions of the Oppressed Chapter 11 Perspectives for a Study of Afro-American Religion in the United States Chapter 12 Freedom, Otherness, and Religion: Theologies Opaque Index Reviews “Significations, a landmark in the History of Religions, will remain a durable classic in the discipline for a long time to come. The beauty of the book, in part, lies in Charles Long's ability to draw immensely from African-American and Indigenous traditions and his personal experiences, to provide theoretical insights into issues of meanings and significance of religion in our contemporary world. This book is certainly one of the most original and provocative texts in Religious Studies available to us today.” — Jacob Olupona, Professor, African American and African Studies and Chair, Religious Studies Program, University of California, Davis “In exploring the meaning of religious meanings, Charles Long has put us in touch with the religious significance of our world by mapping its vast and unfathomable oceans, by charting the relations of human contact and exchange, conquest and colonization, materiality and opacity, representation and interpretation, identity and difference, and many other features of modernity that have all been mediated by vast bodies of water...has directed our attention to global oceanic relations that have produced profound local effects, especially in the formation of America. Significations is a book for thinking with, thinking through, and thinking about thinking in the study of religion.” — David Chidester, Professor of Comparative Religion, University of Capetown Author Charles H. Long speaks to the general meaning of religion in history and culture, and specifically about African religion in the Atlantic world, from a unique perspective. He participated in establishing the first curriculum for the study of religion in the College of the University of Chicago. He was a member of, and served subsequently as Chair of, the History of Religions Field and the Committee on African Studies, respectively, at the University of Chicago. Through his teaching at, among others, the University of Chicago, the University of North Carolina, Duke University and Syracuse University, and a rich and distinguished list of publications, he has influenced three generations of Historians of Religion and African-American Studies.